Why are packets sent to destination “192.168.100.5” (DHCP Server 1) dropped?? Open the object of the involved Security Gateway – go to ‘Advanced’ / ‘Other’ pane – go to ‘Connection Persistence’ – select ‘Keep all connections’ – click on ‘OK’. 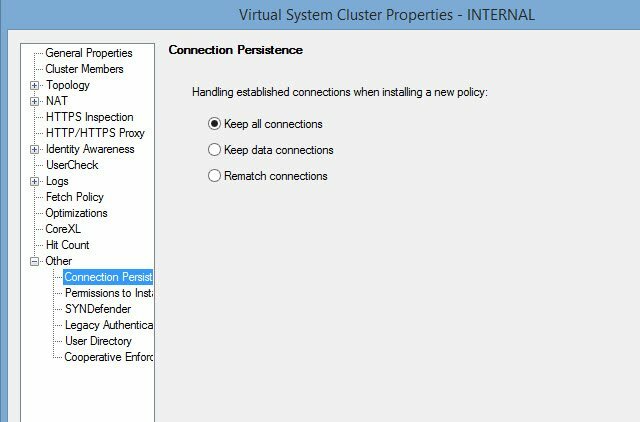 Install policy on the involved Security Gateway. Finally, after running it, the Checkpoint gateway stopped dropping the packets and clients started to get assigned IP addresses. This entry was posted in Checkpoint FW and tagged checkpoint, firewall, TCP/IP by Sysadmin SomoIT. Bookmark the permalink.